Look at this sweet pattern my mom purchased when I was a baby. She started making it but, you all know how crazy life can be with a baby so, she didn't finish it. A few years ago she gave me what she had finished and the supplies she had left. Do you see the blue pig in the center? She made me some crawlers out of that fabric and used the scraps to make the applique pig. I love the embroidery details and the little roses on the fabric. I love having that little bit of "history" in the quilt. It means so much to me. Sewing is my heritage. 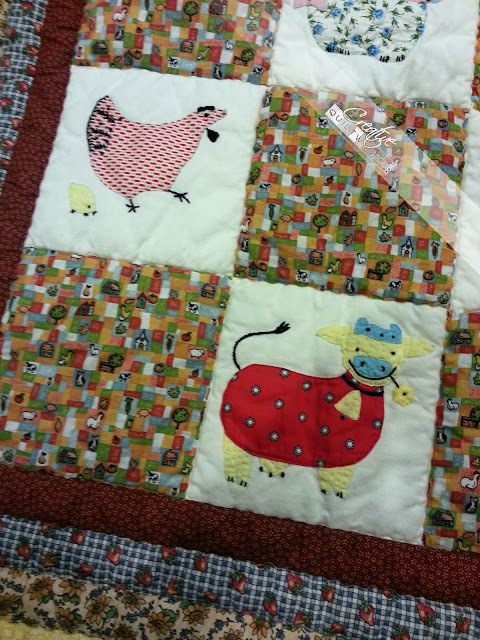 Here is a close up of the cow and chicken with a little chick. She machine appliqued and did the turned edge! I did hand applique with a turned edge because I was traveling while doing this one. 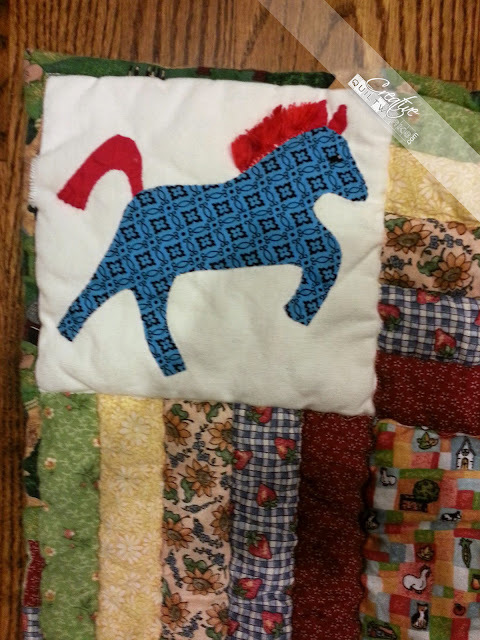 For the horse in the corner, I made a fringe of embroidery floss for his mane. I made little knots at the edge of the applique and left a fringe on the far side. I am tickled that it held up in the wash and gives a little dimension to the quilt. 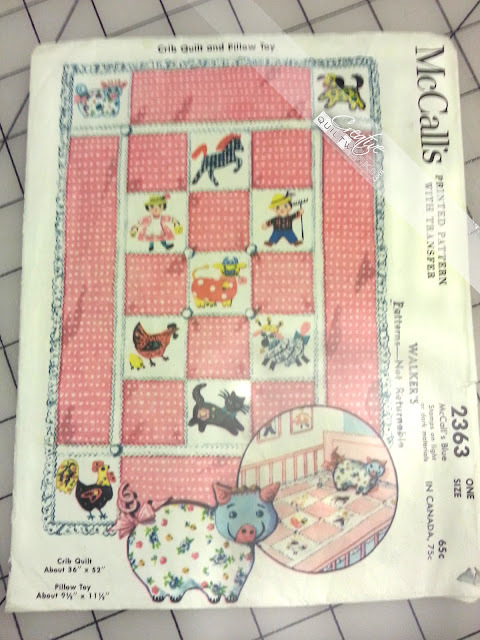 So, a few years ago, I completed the applique blocks and headed to JoAnn's Fabrics looking for some fabric to tie the whole quilt together. 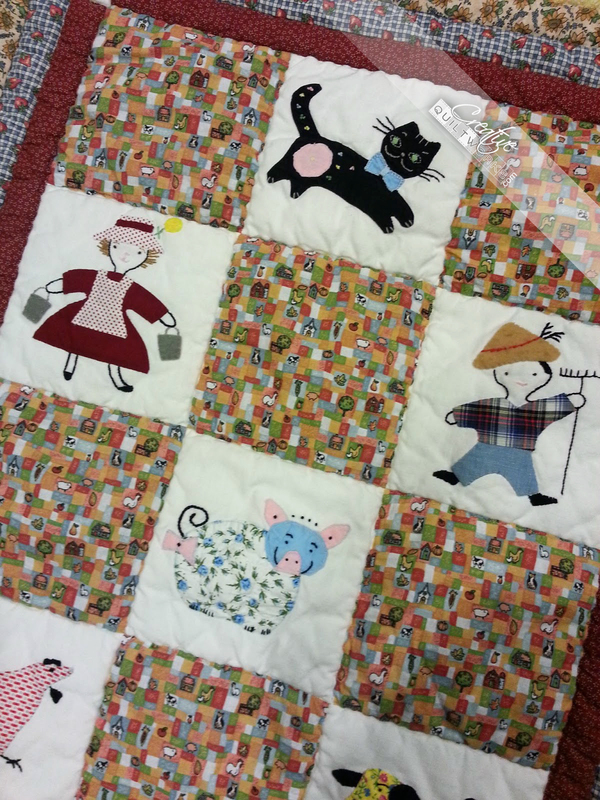 I was happy to find fabrics that I think complement the vintage colors and the farm theme. Here is the finished quilt. 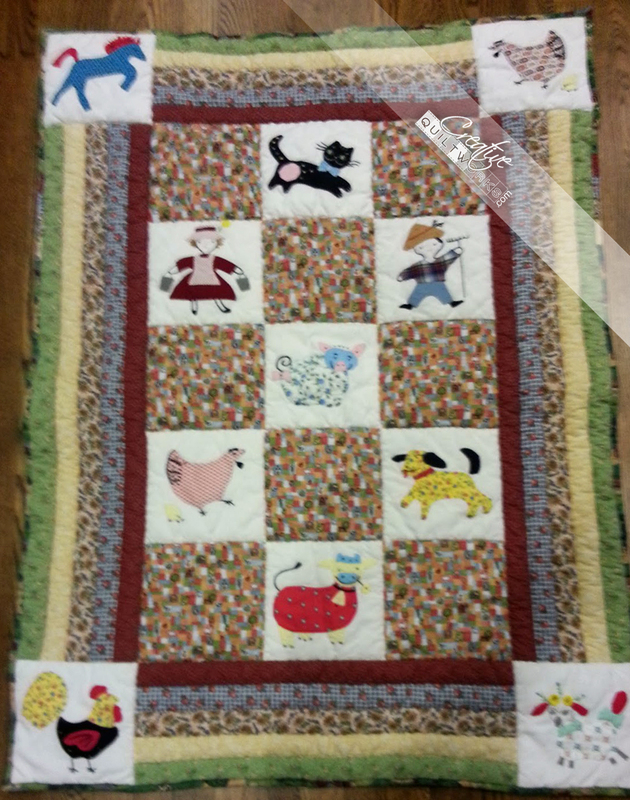 I used puffy poly batting and did a simple wavy line in the ditch between blocks and borders. I love how it turned out. Now I use it with my Grandsons and I like how it connects four generations. I love how this quilt turned out! the border brings it all together so nicely. And what cute vintage appliques!